Watch this video to discover the easy way to make a delicious Weeknight Lasagna Toss! This tasty and fun lasagna toss takes just one skillet. Brown meat in large saucepan; drain. Add next 5 ingredients; mix well. Bring to boil. Stir in noodles; cover. Cook on medium-low heat 10 to 15 min. or until noodles are tender, stirring occasionally. Remove from heat. Sprinkle with cheese; cover. Let stand 5 min. or until cheese is melted. Stir 1/2 cup POLLY-O Original Ricotta Cheese into noodle mixture before sprinkling with the mozzarella cheese. Traditional lasagna can take up to 2 hours to prepare. Our version only takes 35 minutes. You save almost 1-1/2 hours! 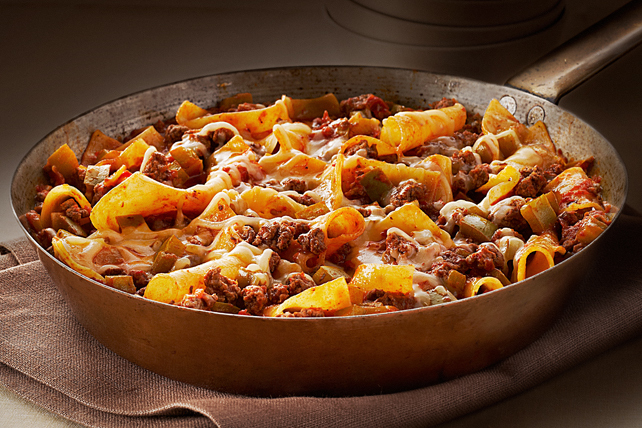 Substitute 12 regular lasagna noodles, broken into small pieces, for the oven-ready noodles. Increase water to 2 cups and cook 30 min., stirring occasionally. Prepare using KRAFT Shredded Mozzarella Cheese with a TOUCH OF PHILADELPHIA.